For serious athletes and adventurers who want to do more, not wear more - f?nix 5S is the perfect fit. It's premium multisport watch that offers full-size performance in a lighter, sleeker, more compact design. So you can beat yesterday with advanced features such as wrist-based heart rate, built-in activity profiles, navigation functions, and performance metrics that measure the effectiveness of your workout. It's one smart sport watch you can comfortably wear anywhere - office or outback - to keep pace with your active lifestyle. 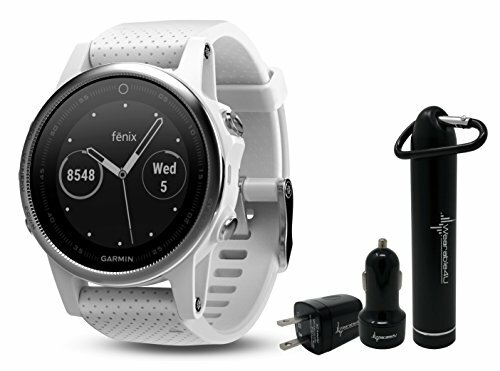 IN THE BOX: 1 x Garmin Fenix 5S White with Carrara White Band 010-01685-00 Premium Multisport GPS Watch ($599.99), 1 x Wearable4U Ultimate Power Pack ($20) that contains Wearable4U Power Bank 2200 mAh, Wearable4U Wall and Car USB Charging adapters. Keep your Fenix 5S charged at all times with our Wearable4U Power Bank and the duo of the Wall & Car USB Charging Adapters!